In 1945, the United States and Soviet Union met at the doorstep of Berlin, Germany, in the aftermath of World War II, and set in motion a nuclear arms race that would last some 50 years. At its height, the Cold War required that the United States achieve extraordinary advancements in the field of nuclear physics. The testing ground for those efforts became a 1,360-square-mile swath of desert, once known as the Nevada Test Site (NTS), outside Las Vegas. In 2016, the NNSS celebrates a storied 65-year history that saw the atomic testing era evolve into a period of peace-time science. In addition to a modern stockpile stewardship program, the Site also is home to many new missions that ensure the security of the nation’s borders and the readiness of emergency personnel against nuclear terrorism. President Harry S. Truman in 1951 opened the doors of the Nevada Proving Ground. 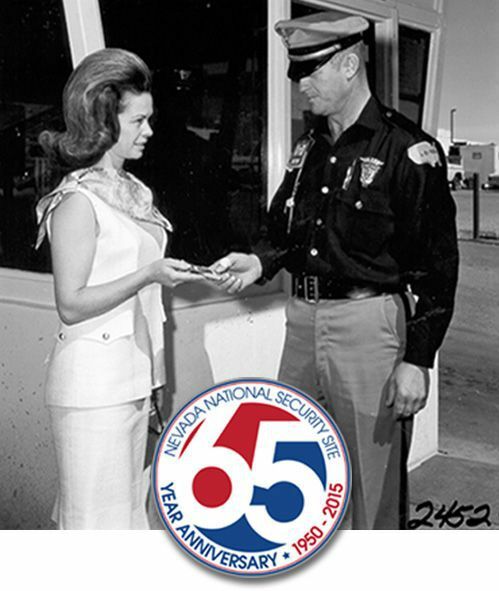 By 1954, the name had changed back and forth, becoming the NTS for good – and indicator of a fast-changing, yet important dynamic to American national security. In 1992, a moratorium was signed ending the atomic testing era as it was known, instead paving the way for stockpile science. But the evolution of the mission of the Nevada National Security Site (NNSS) as it became in 2010, was more than just nuclear weapons. The NNSS also evolved into a testing ground for homeland security and counterterrorism operations support, such as testing nuclear detection systems at U.S. borders and training first responders in mitigation of loose nukes and dirty bombs. As the box office receipts and popularity for the new Clint Eastwood-Tom Hanks movie “Sully” continue to rise, one of the NNSS’s own instructors has had an opportunity to reflect on his role in saving passengers on a downed airliner in the Hudson River in New York. On that fateful afternoon of Jan. 15, 2009, Counter Terrorism Operations Support (CTOS) instructor John McKenna was near the Hudson after getting off work as a New York City policeman. He recalls the moment he found out that U.S. Airways Flight 1549 had crashed. As dramatized in the film, decorated military pilot Chesley B. “Sully” Sullenberger reported a flock of birds slammed into the flight shortly after takeoff, cutting the power in both engines. The aircraft essentially became a glider, and Sully all but ruled out trying to turn the aircraft around and land at LaGuardia. 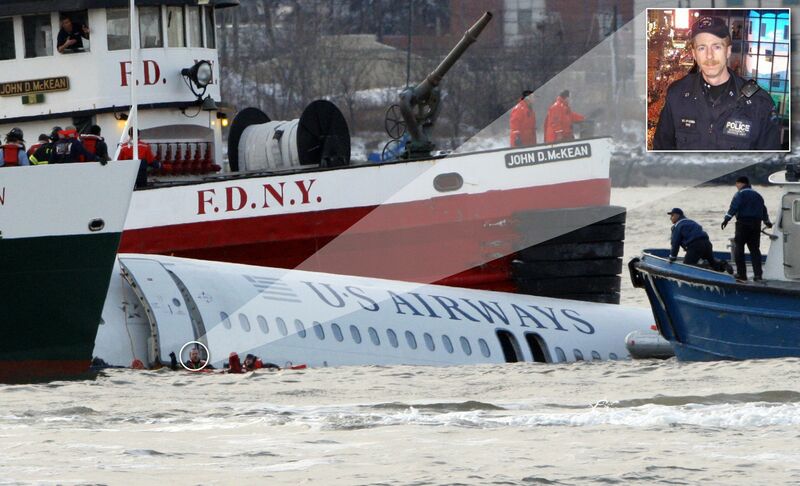 In what has now been coined the “Miracle on the Hudson,” Sullenberger brought the aircraft down safely in the river, allowing all 155 passengers and flight crew to escape, some with only minor injuries. Sully has been hailed as a hero, and the film highlights Sullenberger’s life during and shortly after the crash. McKenna became the first of dozens of rescue personnel who boarded ferry boats and jumped into the frigid waters of the Hudson to ensure passengers made it safely out of the aircraft. For his part in the rescue, McKenna was invited to a special screening of “Sully” two weeks ago that also was attended by many of the passengers. At the time of the crash, McKenna was near the New York waterway, and sped over to the nearest ferry boat. He grabbed his SCUBA gear and waited for some of his co-workers to arrive. At the crash site, numerous ferries and boats already had surrounded the aircraft. The rear of the plane was sinking in the water as passengers scurried out onto the wings and jumping into the frigid cold water to board life rafts. “Everything appeared to be still floating. I jumped into the water, but instead of going to the people who were already out, I wanted to clear what was inside,” McKenna recalled. When the rescuers determined that all passengers had made it out, McKenna and his colleagues exited the aircraft. “At first, we had all the adrenalin rushing but it really started getting cold,” he said. Outside in the water, they helped the last few passengers and crew members board boats still responding to the scene. The pilot and crew of U.S. Airways 1549 have since been honored by the President, and on television and at sporting events. McKenna joined fellow rescuers who were honored by U.S. Airways and New York Mayor Michael R. Bloomberg shortly after the incident. McKenna also was present during a taping of the Oprah Winfrey show in 2009 that honored Sully and the first responders who aided that day. In addition to his work with the New York City Police Department, McKenna travels around the country to teach CTOS training to first responders at various sites. He frequently teaches at the NNSS in Nevada. Sponsored by the Department of Homeland Security’s Federal Emergency Management Agency (FEMA) and managed by the Global Security directorate of the NNSS, CTOS is a highly specialized training course that focuses on radiological and nuclear threats. More than 120,000 state and local emergency response personnel have learned to take immediate, decisive action to prevent or mitigate terrorist use of radiological or nuclear Weapons of Mass Destruction (WMD), such as Improvised Nuclear Devices (INDs) and Radiological Dispersal Device (RDDs or “dirty bombs”). The performance-based, hands-on training is carried out in realistic scenarios at the NNSS, and throughout the United States and its territories via Mobile Training Teams like ones McKenna is a part of. Although McKenna has spoken with the passengers, and even Sullenberger in a phone call previously, it was during such a CTOS course a couple years ago in Cincinnati that McKenna says he realized just how important his role in the rescue of the passengers of Flight 1549 was to others in the emergency response business. “Afterwards though, one of the older first responders came up to me and said, ‘You may have thought you were just doing your job, but you made every first responder in America proud enough to want to be in your shoes that day,’” McKenna says. “That’s when I started realizing what it really meant. Students in Southern Nevada have headed back to school, and thanks to the efforts of Nevada Enterprise employees, many of them now have the supplies needed to make this school year a success. Piles and piles of notebooks, pencils, crayons, markers, rulers, binders, scissors, tissue boxes, writing paper, paper towels, post-it notes, folders, glue and backpacks were donated during the National Security Technologies (NSTec) and Centerra-Nevada school supply drives. NSTec’s donations went to focus schools Kit Carson Elementary School and Jim Bridger Middle School; Centerra-Nevada’s supplies supported their focus school, Jacob E. Manch Elementary School. In addition to supplies, NSTec was also able to donate $3,500 to each of their focus schools due to a fundraising effort put on by employees of the CFO & Enterprise Services Directorate. Firefighters and paramedics from the Nevada National Security Site Fire and Rescue Department also collected hundreds of pairs of shoes, money and school supplies to help disadvantaged children in Las Vegas. 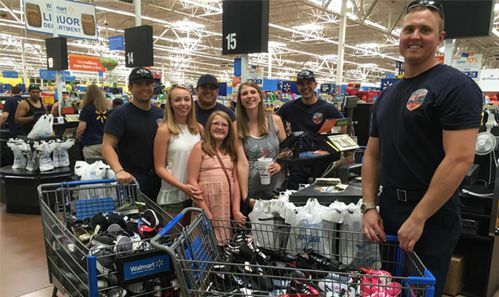 The firefighters collected items at the Walmart on North Decatur and 215. The shoes and money went to Goodie Two Shoes to assist in resupplying their shoe stock after they were robbed of $20,000 in supplies in June. School supplies were collected as part of Walmart’s back to school efforts in helping children around the region. The Nevada Enterprise has unveiled the new logo of the Nevada National Security Site (NNSS) that is more modern and encompasses the entirety of the Nevada Enterprise (NvE). The old logo and its bold outline of the Site is now replaced with a contemporary design that has thinner, more streamlined letters. A blue swoosh at its side soars toward a blue star, reflecting “one NNSS” – one mission, one entity moving forward. The new logo eliminates the Site’s outline because our mission is less about the NNSS itself and more about the work all the NvE organizations do at the Site and outside of it, said Steve Lawrence, manager of the National Nuclear Security Administration’s Nevada Field Office (NNSA/NFO). Removing a visual tie to the shape of the Site helps foster the mission rather than the location. “Our old NNSS logo spoke to the proud legacy of the Site’s importance. But the work we do happens at several locations nationwide, not just in Nevada, so this new design is a statement of the many talents and capabilities demonstrated beyond the Site itself. I am proud to unveil this new Site logo that represents all of the work we do every day,” said Lawrence. Each company will have the capability to identify themselves in the logo by displaying their organization’s name at the right of the swoosh. The NFO and NSTec collaborated on a number of designs, from which they had many to choose. After careful review, the team presented their top choices to NNSA headquarters in Washington, D.C. Great care was taken in what “message” the NNSA wanted the logo to convey. As the Site’s name changed in 2010, so too would its designed image eventually change. Las Vegas, Nevada—The Nevada National Security Site (NNSS) Aviation Program has been recognized by the U.S. Department of Energy as Aviation Program of the Year for 2016. Remote Sensing Laboratory (RSL) Chief of Maintenance Dave Krausnick has been awarded Aviation Professional of the Year, it was announced last week in Washington D.C.
With the award, the aviation team was recognized for being the most outstanding, safest, and most efficient and effective in all aspects of the flight program. The NNSS Aviation Program is responsible for helicopters and fixed wing aircraft that conduct an array of special missions, ranging from aerial surveillance for radiological threats during major events around the world to aerial monitoring for consequence management to wildland firefighting operations at the NNSS. RSL’s aviators also were called on to help in an advisory capacity during the 2011 tsunami and nuclear disaster in Japan. The aircraft are based out of Nellis Air Force Base in Las Vegas and Joint Base Andrews in Maryland. 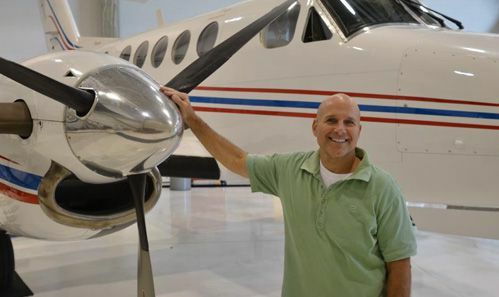 Krausnick was recognized as the top professional in DOE Aviation whose operational skills and accomplishments contributed in the most outstanding manner to improving and sustaining the safety, efficiency, and effectiveness of the NNSS Aviation Program, said Richard Fischer, Aviation Section Manager at RSL. For many years, the RSL program has been noted as one of the nation’s most prestigious programs for excellence and innovation in aviation management and administration, operations, maintenance, training and safety. RSL’s aviation program also was recognized for more than 18 consecutive years of operations without an accident or incident, and several RSL team members have received numerous individual safety achievement awards. NSTec manages operations at the NNSS and its related facilities and laboratories for the National Nuclear Security Administration/NFO. NSTec teams with Lawrence Livermore National Laboratory, Los Alamos National Laboratory, and Sandia National Laboratories on many national security programs. NSTec also works on projects for other federal agencies, as it fulfills its national security missions.